LOS ANGELES, CA— The Alliance of Health Care Unions (AHCU) announced its name today and its first hire: Executive Director Peter diCicco, founder and longtime Executive Director of the original Coalition of Kaiser Permanente Unions, from which the alliance unions withdrew last week. 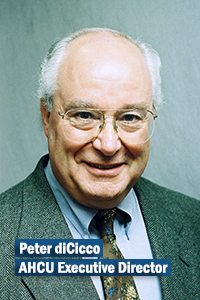 Mr. DiCicco’s most recent accomplishment in a career spanning decades in top positions within the labor movement was to help develop the terms of merger for SAG and AFTRA, two of the biggest entertainment talent unions, now SAG/AFTRA. His union activity began in 1964 as a shop steward at GE in Lynn, Massachusetts, where he worked as a machinist, power generator assembler and aircraft engine inspector. Over the decades since he rose from Executive Board member with IUE Local 501 during a 103-day national strike in 1969-70 national strike, to International Vice President for the IUE in 1970 and President of the AFL-CIO’s Industrial Union Department (IUD) in 1996, before founding the CKPU the following year. The Alliance of Health Care Unions (AHCU) is comprised of 21 local unions in the following Kaiser Permanente operating regions: UNAC/UHCP (AFSCME), UFCW Locals 1167, 135, 1428, 1442, 324 and 770, USW Local 7600, IBT Local 166, KPNAA, and IUOE Local 501 in Southern California; HGEA (AFSCME) in Hawaii; UFCW Locals 27 and 400 in Mid-Atlantic; UFCW Local 7 and IUOE Local 1 in Colorado; OFNHP (AFT Local 5017), UFCW Local 555, and ILWU Local 28 in Northwest; UFCW Local 21 in Washington state; and UFCW Local 1996 in Georgia.